Peach Cobbler screams summer to me. Juicy and sweet tree-ripened peaches surrounded in a buttery crust and topped with vanilla ice cream is as good as it gets as far as summer desserts are concerned. 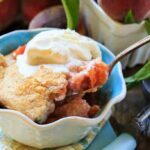 This Easy Southern Peach Cobbler is an old recipe I’ve been making for as long as I can remember. 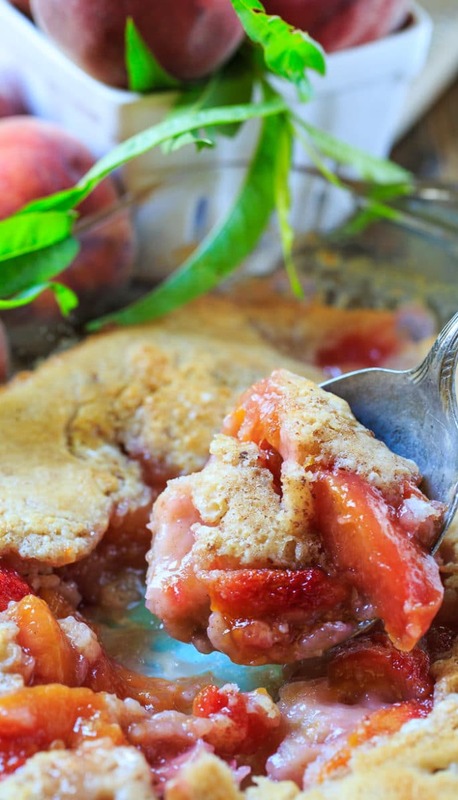 I think it is the easiest and most delicious way to make peach cobbler. You start by melting a stick of butter in a 9×13-inch pan by placing it in the oven. I always use Challenge Butter for my baking. You won’t find a fresher, better-tasting butter anywhere. Challenge Butter is all natural and made with the freshest, purest cream. It contains no artificial ingredients and is made from 2 natural ingredients: 100% real pasteurized sweet cream and salt. 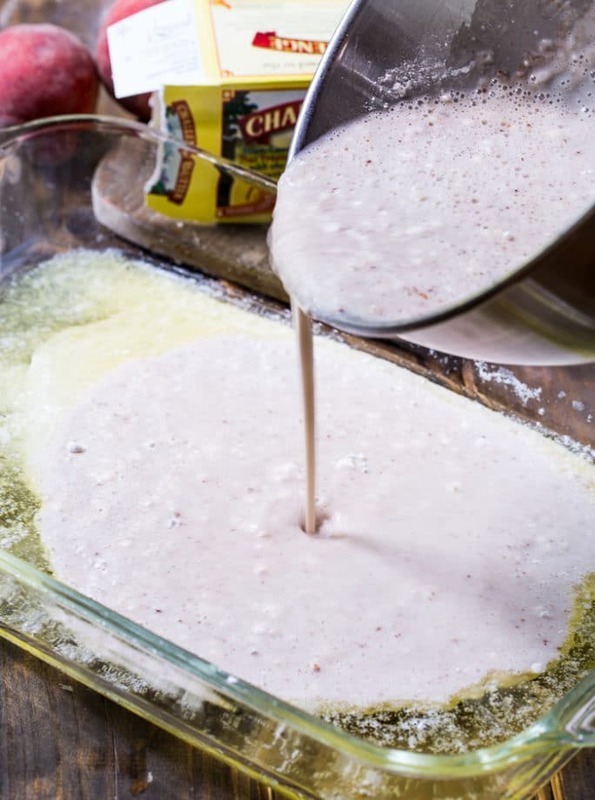 Next, you make a simple batter from flour, sugar, and milk and pour the batter into the pan with the melted butter. There’s no need to mix them together. The peaches get spooned on top of the batter. As the batter bakes, it puffs up around them. The batter forms a rich and buttery crust. Most of the butter gets pushed to the edges of the pan and the edges are super buttery and crisp. A bowl full of warm peach cobbler with a large scoop of vanilla ice cream. There’s no dessert I’d rather have. It’s the perfect ending to a summer meal. 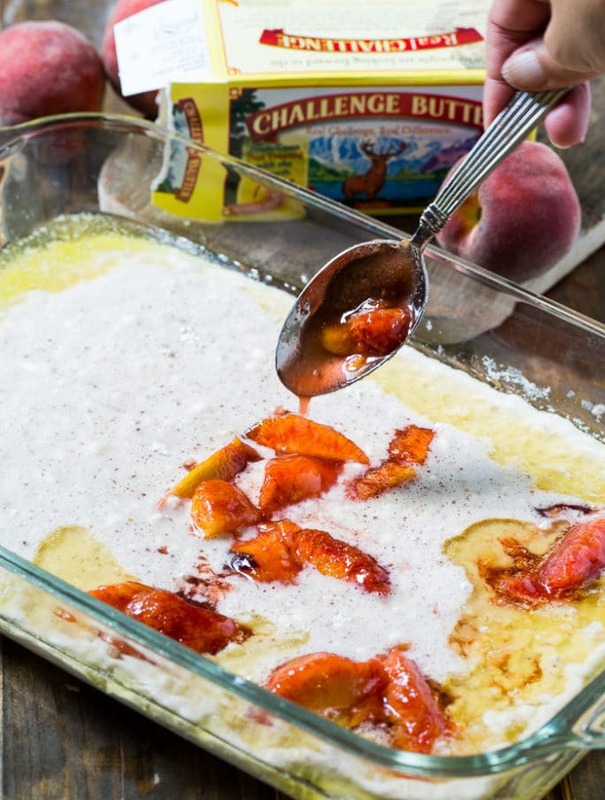 Super easy Peach Cobbler made from butter, sugar, milk, and self-rising flour. Always a summer favorite! Place stick of butter in a 9x13-inch pan and place pan in oven to melt the butter. Watch carefully so that the butter does not burn. While butter is melting, toss peaches with brown sugar, 1/2 cup granulated sugar, and cinnamon. In a medium bowl, stir together flour, remaining granulated sugar, milk, vanilla, and salt. Once butter has melted, remove pan from oven and pour batter into pan. Spoon peaches evenly on top of batter. Disclosure: This is a sponsored post. I appreciate the opportunity to share the products I love and use in my own kitchen. This entry was posted in Desserts and tagged peaches, summer. Bookmark the permalink. Thank you sooo much. I look forward to making it again ! 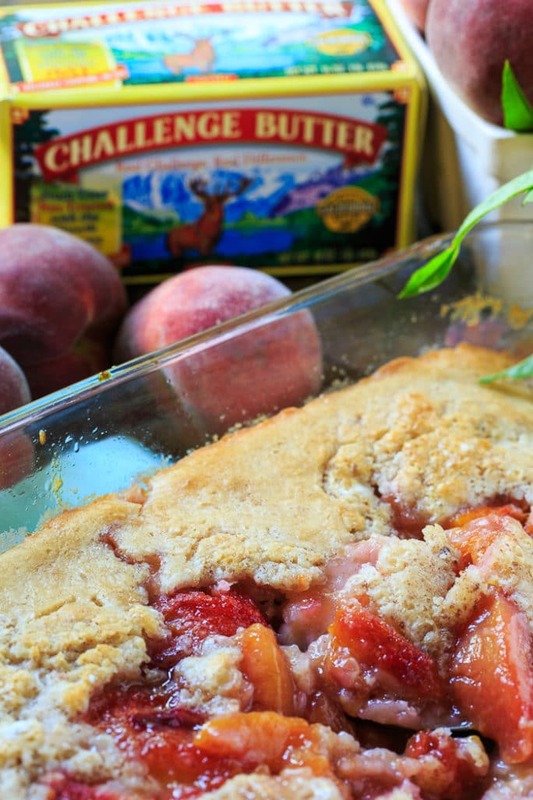 Thank you for this wonderful recipe.This is my first peach cobbler and I’ve looked at the others and I chose this one and this one is a keeper! I can eat this any time of the year and not just summer. I can’t wait to make this with peaches. I’ve always used a practically identical recipe to make apple cobbler and it’s awesome as well. But the last few years I’ve come to adore peach cobbler! Can’t wait! Do you think peaches in can could be used when fresh peaches are not available ? Yes, you can use canned peaches but drain them well. Hi Ethel. I’ve used canned peaches in baking like this for a lot of recipes and I even rinse them under cool water in a colander and put them out on a paper towel to soak up the water. Works like a charm! This recipe is INCREDIBLE! Made it today with fresh juicy peaches, came out exactly as described. Think I will cut in half in an 8×8 pan next time, as a little too much for just me and my husband. Guess we’ll just have to suffer through the leftovers! My husband loves peach cobbler! Do you think I could half this recipe, since there are only the two of us? What size pan would you use? Thanks very much! Yes, I think you could half it and use an 8×8-inch pan. 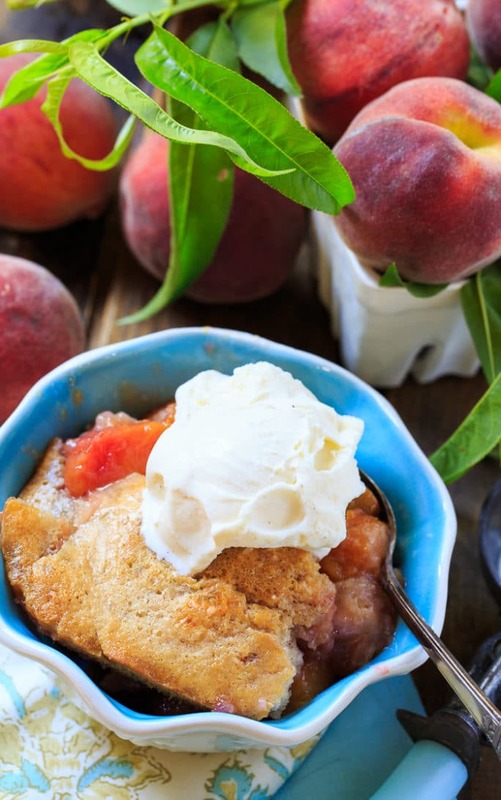 Peach cobbler is one of my favorite summer desserts! I need to go buy more peaches! I just bought my first peaches of the season at the store last week and now am itching to grab more! 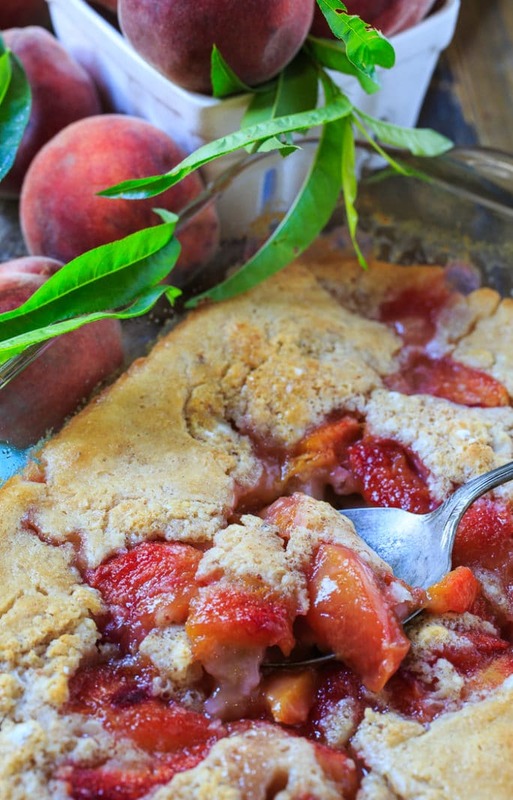 This cobbler definitely screams summer and it sounds delicious! Such a yummy simple thing that I haven’t tried before! Looks so good! I always use Challenge butter and I absolutely love it! 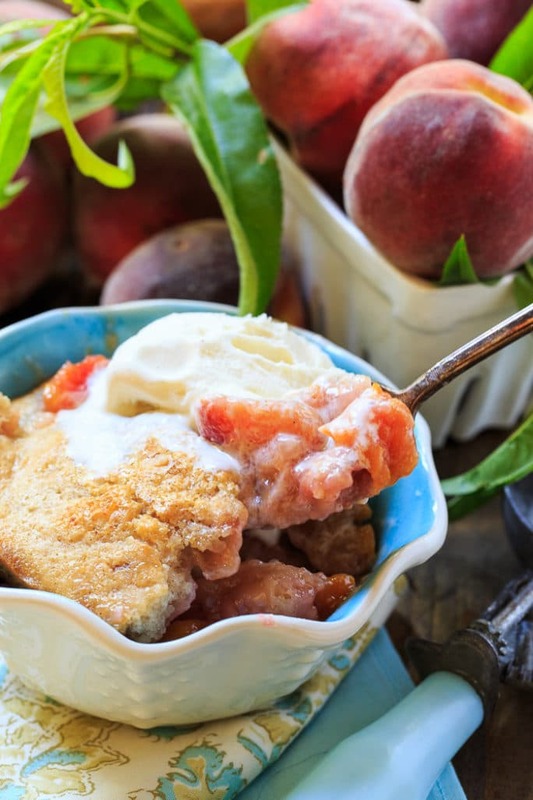 I’m also loving this peach cobbler, such a perfect dessert for the summer! 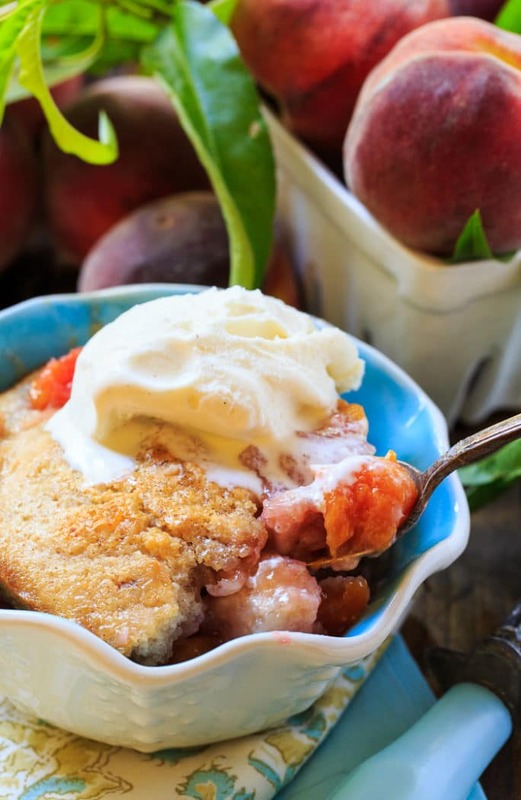 Peach cobbler screams summer to me, too! This looks so good, Christin! I wish I had a big bowl of this for dessert!